July Weather in the Southeast U.S.
Overview of July Weather in the Southeast U.S.
July, the Southeast region's most popular vacation month, kicks off with Fourth of July celebrations followed by several months of summer fun. Both visitors and residents of the area head for the mountains and the beaches in droves to find some relief from the usual hot and humid weather. Temperatures in the mountains are often 5 to 10 degrees cooler than other areas, and breezes keep the coastal areas a bit more comfortable than interior areas. Rainstorms, which often move in and out fairly quickly, are common in July. Hurricane season begins June 1 and lasts until November 30. A typical season can have as many as 11 named tropical storms and hurricanes, although statistically, July has fewer major storms than do the months of August, September, and October. Atlantic Ocean water temperatures in July are about 76 F in Virginia, in the upper 70s and low 80s in North Carolina and South Carolina, and in the low to mid-80s in Georgia and Florida. Water temperatures tend to warm up by about 2 to 3 degrees from the beginning to the end of July. The average July high temperature in Atlanta, the inland capital of Georgia, is 87 F and the low is 70 F. Rainfall averages 4.72 inches over 12 days in July. Savannah, the popular coastal city, can be humid and quite warm in July. The average daily high is 92 F, cooling down to an average of 73 F in the evenings. North Carolina is generally hot and humid in July. The highs can easily be in the 90s F, and possibly over a 100 F. It is normal to have a thunderstorm in the late afternoon, which can temporarily cool things down to a more comfortable temperature. The mountain areas are generally cooler with average temperatures in the 70s and 80s during the day and cooling to 50s and 60s at night. Average rainfall in the state is between 4 and 6 inches in July. Charleston, South Carolina, tends to have hot and muggy weather in July, with some showers common in the afternoons. Daily highs are around 89 F throughout the month, sometimes rising into the 90s. Daily low temperatures are around 76 F. Expect some clouds on more than half of the days in July with rainfall averaging between 4.2 and 4.7 inches. Many visitors go to Nashville in July when the temperatures average around 89 F throughout the month. Daily low temperatures are around 71 F. Humidity levels are high at 89 percent in the mornings, but drop down to an average of 55 percent by afternoon. Rainfall in the state averages 3 to 3.6 inches, with about 4.9 inches in Chattanooga in the eastern part of Tennessee. The mountain area of Virginia stays relatively cool in July with average temperatures in the mid-80s and nighttime lows of mid-60s to low 70s. 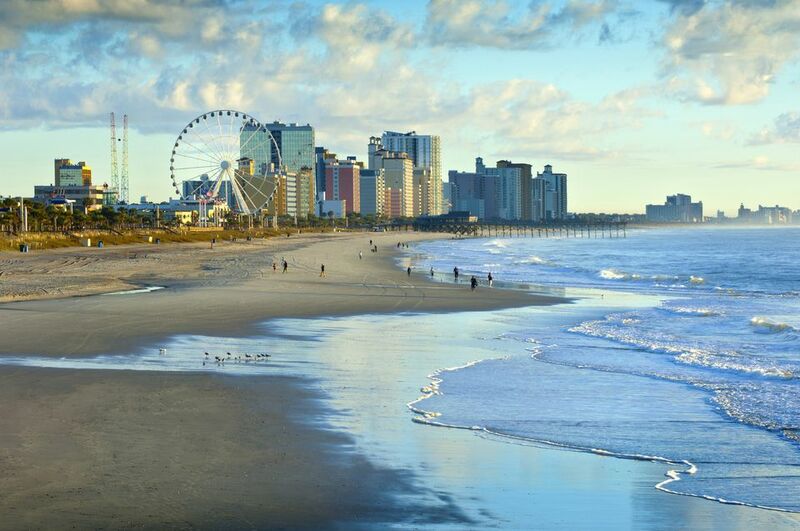 Coastal towns like Virginia Beach are much warmer with average temps around 86 F. Rainfall in Virginia Beach ranges from 3.3 inches at the beginning of the month to 4.3 inches by July 31. Florida is a very popular destination for summer travelers, but the weather in July can be hot with occasional thunderstorms. Average daytime temperatures range from the mid-80s to low 90s, with nighttime lows averaging 72 F. Orlando, the site of Disney World and Universal Studios can reach well into the 90s. Ocean temperatures are at their warmest in July at 84 F.